The limits for crevice gardens and where they can be built are being blown away. 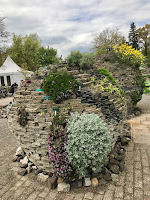 This year, my research mission was to find out the reasons the Czechs and the Scots/Brits dominate the rock garden world; and one of those reasons, simply and amusingly, was availability of rock in those places. Those folks took what they had and did amazing things. I feel the same way about Plant Delights Nursery and Juniper Level Botanic: They are forever looking for more ways to grow more taxa to add to their existing 24,000 (yes, no kidding) and they used stacks of demo material to do it. What’s so different about working with concrete? Well, for one, it’s not stone. Something I mentioned in the prior blog, and artistically something I’m still getting my head around. Practically, it meant we could cut, break, chisel, and sledge to get peices we wanted. Jeremy was amazing at manufacturing the rough-edged but structurally-sound shapes needed to approach our very steep hill. Jeremy, (Grounds and Research Supervisor) and Tony, owner/founder, pointed out to me that the three main components of this garden’s construciton are totally recycled. The concrete chunks were from the driveway and barn floor of a removed building on property. 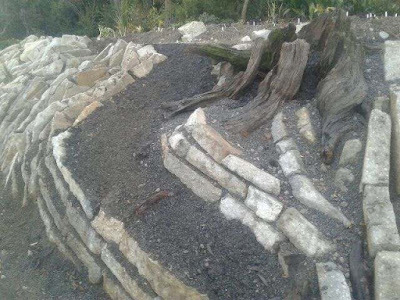 The Permatill, an expanded slate, which makes up most of the soil mix, is a cinderblock byproduct. And the compost which is layered over the open zones is made from the leaves from the nearby city of Garner, NC. Just think: Waste products, waste products, and waste, put together to make a cutting-edge garden installation. I’m so honored to be around for it. 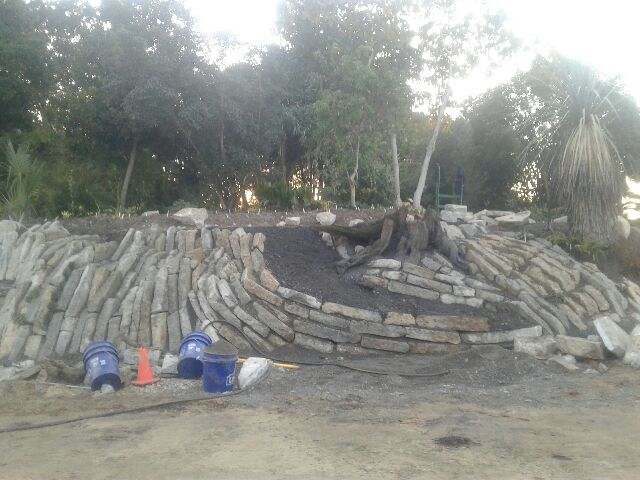 With help from Michael Peden, Jeremy and crew built the first third of crevice garden, I helped with third last week, and a third more remains to be done, literally down the road. Let’s talk more about the mix. Based on growth since just March in the existing beds, it’s been amazing. Let’s call it the Schmidt mix. What’s this magic Permatill stuff? In Colorado, Expanded shale is our equivalent. In Utah, it’s Utelite, in the UK, Seramis and in the Czech republic, baked clay. 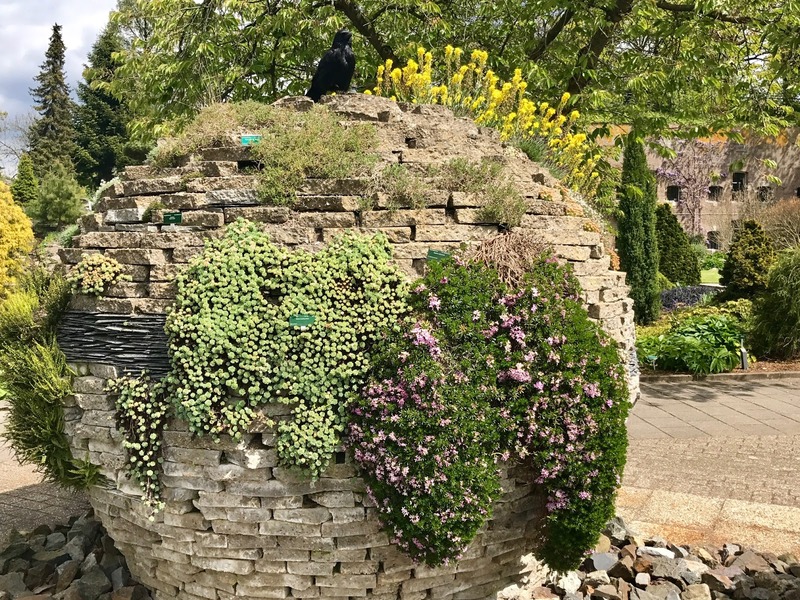 These materials are used in green roof mixes, as auto oil absorbers, kitty litter, and industrial settings like high-strength concrete. We also used what I want to call the Utrecht trick. We mixed in a bit of “clean gravel,” 1” size, to the Schmidt mix which went between urbanite layers. Gerard Van Buiten at Utrecht in Holland told me that they mixed scoria into the soilmix which, like layer-cake icing, went in-between the layers in their crevice spheres, keeping the crevice open and preventing collapse/crushing/compaction of the soil. Our soil using the “Utrecht Trick,” with temporary wood spacers. Did I also mention the alkaline seep? No. 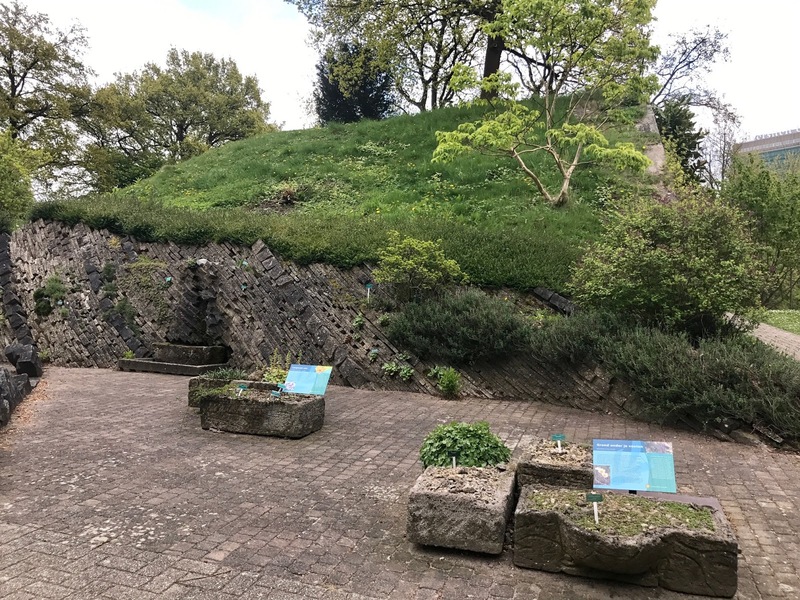 Well, we made a place for a trickle of water to dribble in, over, and steep in the concrete, creating a wet, alkaline place for plants which couldn’t even imaging a day in the local soil’s 3.2 pH. Jeremy Carved and chiseled channels in a few of the concrete chunks to divert the trickle of water. Tony makes a lot of jokes in the PDN Catalogue about killing waves and waves of plants to get hardy plants or learn how to grow them. Well, it’s not a joke! Their successes are based on what they learn from the slaughter of a great deal of plant materials they’ve spent years growing, as well as nurturing the survivors of broad trials. Onosma taurica from the NARGS seed exchange! Oh yeah, plenty of plants in the first section of crevice died. But what is alive which they could not grow before? Penstemon baccharifolius, Limonium, Goniolimon, Lithodora, Teucrium, and just about anything with silver leaves. He is excited to grow the aroids which are found in rock rubble in the mediterranean like the elusive white form of Dracunculus vulgaris. 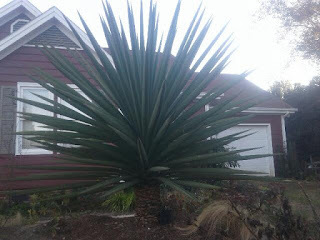 Jeremy taught me how using a breadknife upwards to prune out lower, dead leaves of Yucca not only can saw through the tough fibers, but the blunt end doesn’t poke/damage the base of living, healthy leaves. He also sold me on the idea of using rebar as a temporary, (perhaps permanent?) prop to hold up layers of our work while we were in motion. I also had the pleasure of getting ot know Zach, their in-house Taxonomist (how cool is that?) whose golf-cart, among the fleet, certainly racks up the most miles of them all while he zips around the nursery tracking plants, their names, and their genealogy… It was surreal and dreamy to be in a place where there are real daily conversations about the marital history of agaves. Tony was excited to try Zauchneria cana as they have planted Zauchneria for years with no success. I’m hopeful for it here. There is no better institution better equipped to diversely populate and track and share the results of what can be grown in a crevice garden in the southeast. Prepare to see some amazing stuff. 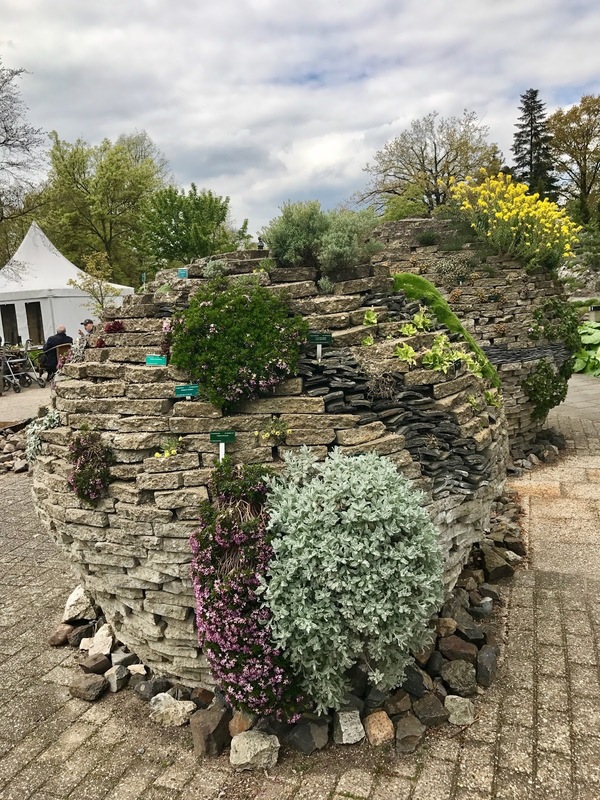 What is also deeply exciting is that Juniper Level is exploring for Americans, with all the reluctance of a sumo wrestler doing a cannonball into a kiddie pool, the wider universality of crevice gardening- that a concrete crevice garden can be made virtually anywhere there are people. Now the playing field is level! There is no excuse for any region not to be able to build crevice. (Warning: more recycling ahead) We went all Angkor Wat/Ta Prohm to include a rotten tree trunk here, worked into the concrete as though it had grown out of it and helped break it apart. A little nihilist’s garden feature. Jeremy has continued the theme. This is some Mad Max rock gardening.